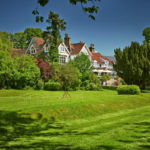 The Rowhill Grange champagne afternoon tea is the perfect way to spend a lazy and relaxing afternoon in the picturesque Kent countryside. This beautiful restored boutique manor hotel boasts elegant surrounds and formidable dining. Afternoon tea is served in one of the hotels intimate lounges, bar or restaurant. In finer weather, afternoon tea can be taken alfresco on the outdoor terrace. 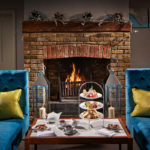 Your champagne afternoon tea for two offers a mouthwatering selection of seasonal, finger sandwiches and delicious cakes, pastries and freshly baked scones with clotted cream and sweet jam. Accompanied with your choice of tea or coffee, treat yourself or someone special to a luxurious afternoon tea in beautiful surrounds. Our delicious afternoon tea package is available via Virgin Experience at £64 for Two. Available to buy as a gift voucher, this would make a perfect gift for someone or simply to treat yourself. The Rowhill Grange afternoon tea voucher is valid for up to 9 months so plenty of time to organise the diary. To book or for further information, simply select the Book Now button.